To describe the flamboyant American flamingo (Phoenicopterus ruber Linnaeus 1758), it would be simply sufficient to repeat what already indicated for its twin, the Greater flamingo (Phoenicopterus roseus) as until a few years ago the red was classified as a subspecies of the other or vice-versa depending on the authors. Some morphological characters, in particular the colour of the livery and the neat distinction between the two territories occupied by these species, could induce to the certainty that sooner or later they would have reached this conclusion. On the other hand the original scientific name of Phoenicopterus ruber, already given by Linnaeus in the XVIII century, was more nailed for this new species as identifying the most evident red colour. So we can better understand, when they suggested to subdivide and classify the new species, the idea of maintaining the original name of “ruber” and assign the name “roseus” to the old species due to the fact that the single terms better represented the two colours. However, even today the new classification is not always shared and often the relevant literature refers to the Phoenicopterus ruber ruber for the red and Phoenicopterus ruber roseus for the greater one. The red is one of the flamingoes more present in the zoos and in the naturalistic gardens due to the sparkling colour maintained as such through a feeding rich of carotene and of other colourings rightly with the purpose of conserving a colouration that the specimen would loose after a short time as missing of its natural food. Furthermore, it shows a remarkable character of docility willingly accepting the habitat created for this purpose that leads it without any difficulty also to the reproduction in captivity. The etymology of the scientific binomen is based expressly on the showy colour of this bird. Phoenicopterus gets its origin from the Greek “phoinix” = red, carmine and “pteron” = wing. The species comes from the Latin “ruber” = red due to the colouration of its livery. Here are some vulgar names given in Europe. In English Caribbean flamingo, in German Kubaflamingo, in Spanish Flamenco rojo, in French Flamant des Caraïbes, in Dutch Caribische Flamingo, in Portuguese Flamingo and in Italian Fenicottero rosso. It is to be noted that already in the common name given by various countries, was clearly indicated the provenance of this flamingo, already putting in place, at least at geographical level, a clear distinction with the pink flamingo. 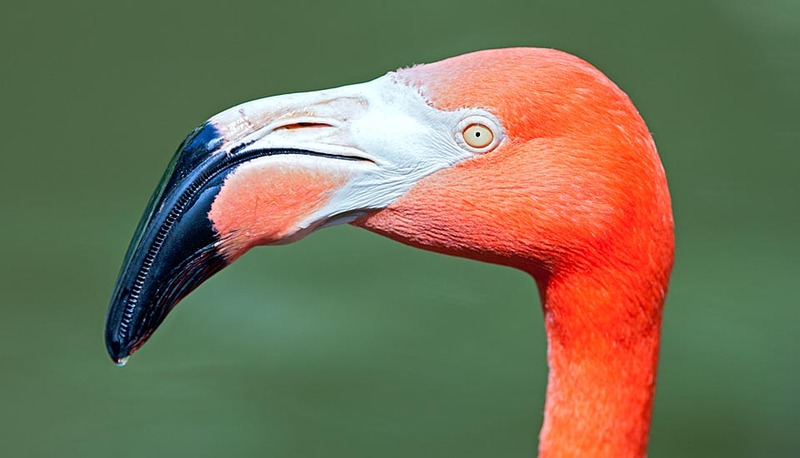 The American flamingo is typically American occupying an area going from the south of USA down to the northern coast of Brazil but also up to the remote Galapagos Islands. It is well diffused in the central part of the continent, hence the various vulgar names that take the Caribbean area as reference, gradually attenuating northwards, where it becomes very occasional in the USA, as well southwards where has its limit on the Caribbean coasts of the Guyanas and of Brazil. In the south of the American continent it is replaced by the congener Chilean flamingo (Phoenicopterus chilensis) that reaches the extreme south of Patagonia and on the Andes by two species quite localized and with overlapping territories, the Andean flamingo (Phoenicoparrus andinus) and the James’s flamingo (Phoenicoparrus jamesi). The new continent boasts as many as four of the six species of flamingoes present on the planet. 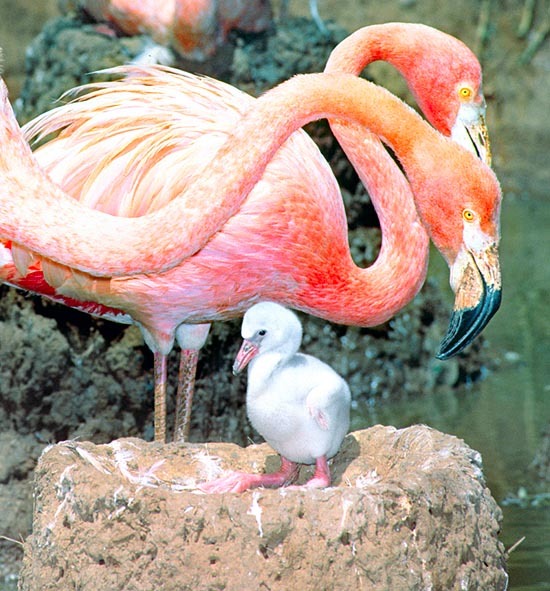 The American flamingo is a typically sedentary bird even if it does not show that particular and strong attachment to habitual zones as evidenced by the congener of the old continent, whereby specimens born in one place are found often nesting in other sites quite different. 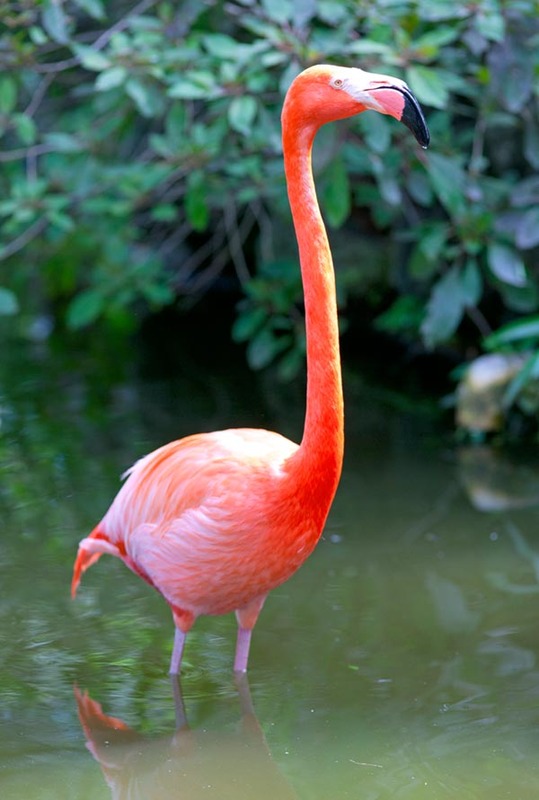 Like all flamingoes also the Phoenicopterus ruber lives in salt marshes, alkaline lakes, reservoirs for the extraction of sea salt but does not disdain rivers mouths, coastal small lakes with brackish water and sites temporarily flooded. It too, nourishes of microcrustaceans such as the Artemia salina , larvae like the Chironomus sp. or cyanobacteria such as the Arthrospira, Oscillatoria, Lyngbya and Navicula that live in these highly specialized environments. The food catching happens through the filtering of the water with the use of a bill highly specialized for this activity. Turned over the head and immersed the upper part of the bill just under the surface, the water is frantically sucked and at the same time expelled through the frantic movement of the stubby tongue that operates like a piston of a scooping pump. The microorganisms are held by small baleens that surround the margins of the bill and ingested immediately without ever raising the head from the water. An industrialization of three simultaneous operations, obtained by means of a capacity acquired since millennia. 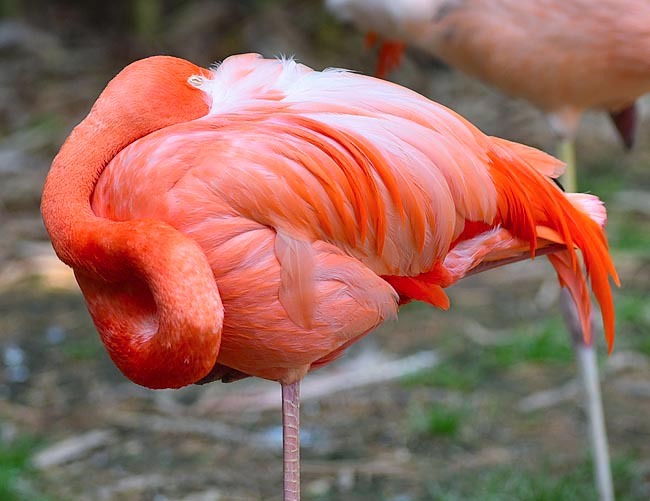 As aforementioned, the American flamingo has the livery completely tinged of this colour, in particular during the period of nidification when the hue is more accentuated. However, it keeps most of the colouration also during the other periods of the year. The legs are reddish and the bill robust and bent of 90° at mid-length, is pinkish in the first part and in particular in the lower mandible and black on the tip, at the fold. This part is the one totally submerged under the surface of the water while looking for food. This adaptation has led the lower jaw to be slightly wider than the upper and like in some parrots, the upper one is slightly flexible and is not rigidly attached to the skull. Seen the length of the neck and the effort necessary for keeping it stretched, when resting the flaming must curl it up and lean the long bill between the feathers of the back. Only way for giving peace to the muscles of this extremely long appendage. The remiges are black and are visible only when the wings are spread while remain practically invisible when the bird is on the ground. 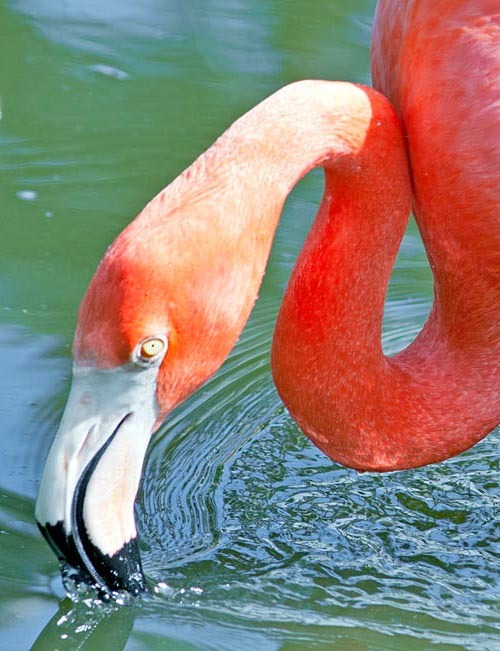 This bird has remarkable dimensions equal to those of the congener greater flamingo. It may reach, when upright, the 150 cm of height, with a weight that can vary from 2 to 4 kg and a wingspan of 150 cm. There is no sexual dimorphism apart in the size where the female is slightly smaller than the male and in the precocity in dressing the nuptial livery, in fact the female “reddens” some time before the male. The young do not have the colouration they will take when reaching the maturity, usually around the 4 years, even if the female evidences a bigger precocity. 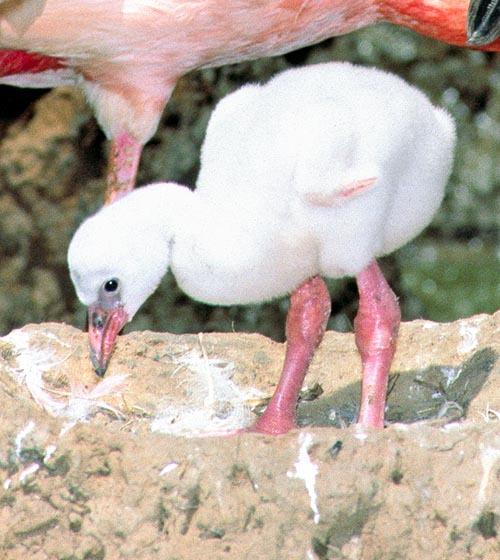 For the American flamingo there is not a fixed season for the nidification. It can choose the rainy period or the dry one and is also in function to the latitude where it lives. In any case it nests with an annual frequency. 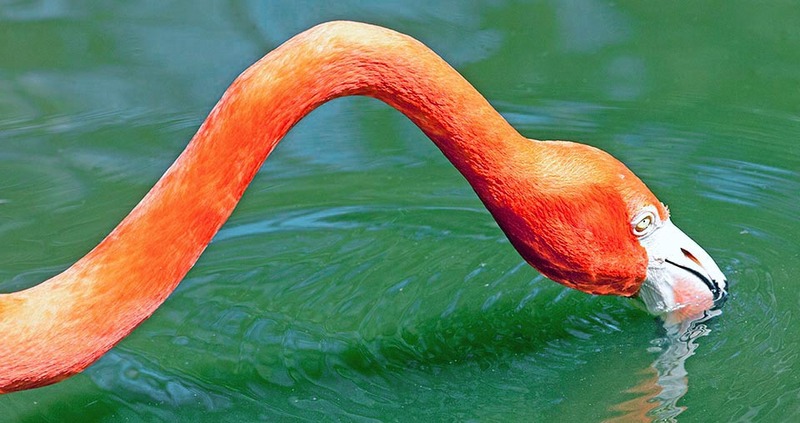 The flamingo is a so much social bird that it spends its existence always with its similars. It does so outside of the reproductive season but even more when is approaching the time of the courting and of the preparation of the nest when the colony unites and all gather in immense flocks so closely to keep practically within the reach of a bill. Also the courting is grouped and the males perform dances organized and well coordinated with each other with extremely morbid and elegant attitudes putting in evidence the very long neck, kept vertically upright while they go walking all together in the shallow water and shake the wings showing the vivid colours of their livery. Also the females respond in the same way and consequently in the general turmoil it is impossible to realize who are the suitors and who the courted. The American flamingo is monogamous and forms stable couples during the nidification even if habitually changes the female at each season. The nest has the shape of a truncated cone and can reach the 20 cm of height and forms on the summit a small basin where 1-2 white eggs will be laid. Both partners contribute to the construction of this odd nest carrying mud and specks of straw collected all around but will be utilized only when the material will be dried up and the nest ready to use. In the colony the nests are very close each other and may be placed even at only 50 cm from the neighbour. The chicks are born after about 30 days and are covered by a thick whitish down that will cover them until the first juvenile moulting when the first true feathers will come out. During the first weeks they are nourished with a reddish and very nutritious liquid regurgitated by the parents directly into the throat of the nestling and quite similar to the so-called “pigeon milk”. In some way it is much more similar to the human one seen that it contains the prolactin, the same hormone produced by the woman. In order to become autonomous they will have to learn as soon as possible the technique of the filtering of water, operation that occurs after various weeks. However, almost immediately they are able to toddle out of the nest and after a very few days to reach the nursery that in the meantime is forming inside the colony. As a matter of fact, all the young are collected and guarded in a protected and central area of the colony, thus to be sheltered from possible aggressors. It is unimaginable how can a couple find inside this turmoil its own chicks. Important is the initial imprinting of identification of the voice of the parents, failing which the chick does not have any possibility of survival. The young will take flight after about 13 weeks and will remain in the colony almost surely for all their life. The American flamingo is very long-lived and can live in nature up to 30 years, therefore the species is not potentially at risk. Even the predators are not many: eagles, big birds of prey in general and some mustelid by sure do not decimate their number. Conversely, it is quite latent the risk of transmission of epidemics, seen the considerable promiscuity, such as avian flu and tuberculosis that can rapidly decimate entire populations. It has been noted that the flamingo with most coloured livery finds more quickly the partner for the nidification. A pale colour besides indicating the immaturity, is sign of malnutrition or of a current disease whereby in the genetic evolution or, better, in the harsh law of the forest, the subject is drastically set aside if not even rejected. One might say, vanity effect but in the reality the nature takes its inexorable course. Phoenicopterus roseus Pallas, 1811; Phoenicopterus ruber roseus Linnaeus, 1758.